Despite a popular belief the drive show on radio stations is used for commuters winding down after work, a new study suggests it actually energises people to get into their evening plans. 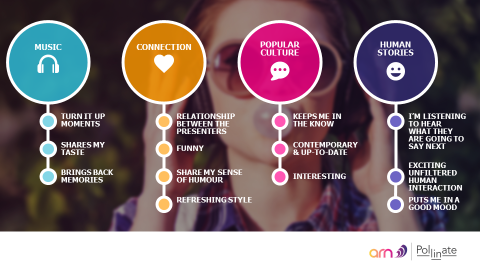 The study by research company Pollinate and commissioned by the Australian Radio Network (ARN) looked into the behaviours of radio listeners for a comprehensive overview of radio’s audience. Reality TV and TV streaming on the other hand were the ‘winding down’ activities for much of the population. The findings also showed on-air talent plays an intricate point to consumers’ radio habits. The research involved qualitative and quantitative data. Pollinate used online diaries of 40 participants and asked them to record their emotions across a working week and what role media and content played. There were also 12 two hour interviews to look deeper, along with a 1600 person study to establish metrics. Basically, we’re anxious and frustrated a lot of the time during the week. TV streaming, reality TV and music streaming were the “switch off” mediums used for relaxation. Facebook was a stimulant, but not always positive as some were left feeling disconnected afterwards. And radio was the ultimate uplifter. And when it comes to talent on radio, the study suggested listeners considered their favourite talent a “super friend”, one they feel connected to as they often share details of their personal lives. Radio is so much more than just audio now, said Tony Kendall, CEO of ARN. “In the past five years it’s exploded across multiple platforms, particularly with social, and understanding how audiences engage in this dynamic environment helps us to deepen the relationship we have with that audience,” he said. “These findings help ARN further develop out content offering as we look to increase the time our audiences spend with us across all platforms.